Last month, one of my favorite bloggers, MOV, wrote a really great post. After reading a really great post, I usually leave a comment, telling the blogger how much I enjoyed reading his or her post. In this fashion, I scrolled to the bottom of the post and began typing words of praise. After reading this stirring comment, I looked at the words that I had begun to type, and realized that nothing I said could compare. 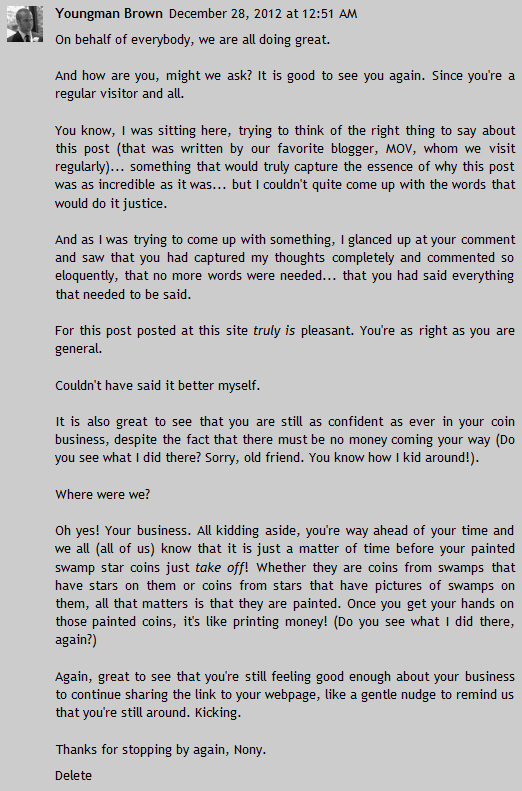 Clearly, this Anonymous user had a better understanding of MOV’s post than I ever would. Not only that, this Anonymous user was polite. I hadn’t even thought to start my comment by classifying myself as a regular visitor and politely addressing everyone. I felt bad for him. He had asked everyone how they were doing, and not a single person took five seconds to reply. I could see him sitting there, refreshing the page over and over again, waiting for someone to write back and tell him how they were doing. I hope that you read my response carefully and took it to heart. Because I want to instill a lesson upon you all. This is what I ask you, gentle readers: In your travels across the interwebz, if you happen to come across someone who posts a comment anonymously, don’t just assume that they are a spammer who is desperately attempting to get traffic to their obscure website. Also, don’t blame them for posting anonymously. Perhaps they are shy. Or in the witness protection program. Who knows, maybe their name actually is “Anonymous.” And if this is the case, don’t you feel awful for ignoring them? Their parents clearly hated them for naming them “Anonymous,” so why should you add to their pain and suffering? It’s not their fault. But most importantly, when they ask everyone how they are doing, don’t assume that they are simply trying to be polite or don’t know what else to say. They actually care about your well-being. They are people too. They have hearts and they have souls. Well, some of them do. I feel quite guilty, as I have never thought about the feelings of these anonymous commenters. And think of all the anonymous comments in my spam folder! It's terrible. So perhaps by this one anonymous comment, I'll be righting all my previous comment judging wrongs. Plus, I'm scared of you yelling at me. You have taught me the errors of my ways, Youngman. I have always looked upon these Anonymous comments with much distain. No longer shall I unrightfully cast aside their unselfish, tactful comments. Hilarious! I saw this over at MOV's. What a great way to start a Monday morning…with a good laugh. Thanks, YB. Thank you many things friend for making benefit to my webpage. I am grateful and have you seen my milkshakes they are magical. My name is Anonymous, and you have probably met me at my Alcohol meetings with my (former) boozy pals. It is rough being anonymous, and I am very greatful (grateful? ah, whatever) to you for shining the spotlight of attention wear (where? like it matters) attention is needed most: on the poor, unrespected drones that so desperately need attention. Private and anonymous attention, natch. Please reply to me in caps. I need more anger in my life. I have started to reply to some of my anonymous readers. I also visit their Web sites and leave friendly comments for them. If they are going to visit me, then I'm going to visit them. I'm waiting for the wrath! What can I say? I'm a rule-breaker. Pretty! This was an inсredіbly wonderful post. Τhanκs fοr ρroviding this info. I thought this one was real for a second. THAT'S BECAUSE YOU'RE A REALLY NICE PERSON. You're milkshakes truly are magical, boys. I am glad that I could help you see the light. You've made everything better with this one post. As always, I am pure enjoyment from reading your fine website. When updation of your blog occurs it makes me fine happy! Best financial prosperity occurs when you visit my website: http://www.poopinmoney.com. Happy Days! (I like your style, Mr Brown). I have pleasure to enjoyment of not discovery deterioration of having made readings your blog. I have satisfied for my answered wholeheartedly advised! I truly enjoy the post that you posted about on your blog here. I wish more people posted posts such as this as the information is well good and profitable to you. Please see my page where many others like yourself have gather. I found your post most helpful, in matters of deciding general importance to associate with friendship. Your insights are matter-of-fact and joyous in the time of love and honor of parentage. Thank you for your eloquent words to give hope. Hello other pleasant, albeit suffering peoples with names like mine. How are everyone does toady? Very smooth posting on your post here browny Young. I am certainly glad that I am happy to have read it. Happier am I that you recognize the power of my people. You are so considerate, I would have just blanked this poor person. May Anonymous be happier and more trusting on the Internet…. or not. Also all the other Anonymous comments cracked me up! You make bad days better. I hope you enjoy my vibration. Oh man… I feel guilty about all the people I wrote off as spam because their comments were too polite/too vague/too irrelevant. Shame on me. Call me your Wholehearted Adviser. I've always wanted to gather with others like myself. Preferably exact copies. I'LL GO POSTAL ON YOU FOR NOT POSTING ANONYMOUSLY. THEY TOTALLY CRACK ME UP TOO. It is a tough vernacular to master. I shall visit your Mynd of Cheese regularly. Would that make you a friend with benefits? I can't even get Blogger to post a real comment from me without it getting obliterated…and it lets *that* comment through?! You make happiness and joy and helpfulness thank you! This is wonderful posting about topic that I have been meaning to find on more information about. I am thankful to you for providing for me. I had almost give up when my brother pointed you for to me. Keep up the good work of your postings. I've saw your post in the past and was in awe of all contents and relevant materials, laid out in such a fortuitous manner. I saw your post on the Dr. Oz show a few days ago and was amazed at the results. Today is my 8th day being on your program and I am 11lbs down!! :) I just want others to know when something works. Good luck to you all! Your words grace me purely. frimpong and coquelin on loan from arsenal. that it is possible to repay the money quick loans uk generally, it is a one page application form that really needs to get filled in and submitted as well as documents for scrutiny by loan-officers. abroad, you may probably believe it is beneficial to open a multi-currency account. the fees can be a fraction with the $639 billion in assets that lehman brothers holdings inc lehmq. Shadow skills minister Gordon Marsden said: “While I welcome these concessions, real fears remain on the impact FE loans might have on the sector online payday loans times are tough for sure but to think you are able to't advertise and grow your business is crazy. Sloan Yes, I think, Betsy, it had not been anybody specific category, however it's a combination of some one-timers that there were within the second quarter versus the 3rd quarter Online Payday loans no credit check needed process is going to be done at lenders end with there being countless beneficial aspects you will check if you happen to be waiting only to incur small money advance. I love the gentle man as I would desire to believe that you'll find excellent achievements he did for my country; by way of example, he helped Tilahun Gesesse through his latter times payday loans online a paycheck-to-paycheck lifestyle is frequently very bad for the budget. will vary, which could influence the form of car you find yourself buying. for a loan on this type might be 300% or older. Loan is usually proved to be a financial burden for you 100 day loans if you are a tenant then security interest is obtainable to you personally without any uncertainties. the county who's a fixed month end salary which in different case should no less than be 1000. It's crucial that you need to do all which is in your power to own your name erased, because it can hurt your chances for payday cash advances, acquiring jobs, and traditional loans next payday loans these two savings make the program a large win for first time homebuyers helping them be entitled to more home for less money.